It has been proven that people who enjoy doing something don’t want to know how long it takes to do it while they do it, they just want to pass lots of hours doing it without being conscious of the time. This fact goes with guitar also, a lot of people want to know how long it takes to learn the guitar, but the most important thing is to love the guitar and every bit of the strings you play even while you are not an expert yet. Some people get frustrated from the start because it is not coming as they expected, and then they drop their interest, pick it up again just to drop it again. They become so inconsistent with the guitar. This makes it difficult to give a straight answer to the question How long does it take to learn the guitar? because it all depends on the level of interest. If you have interest in something, then you have your heart fixed at it, if your heart is fixed at something, then you’ll surely give it your all, if you give it your all, then you’ll come out refined and as the best. That’s the summary of what it takes to learn the guitar. You must truly have interest in it. Your interest must generate action, some interest doesn’t lead to work and action. If you have interest in learning the guitar, then you’ll need a lot of practice. You must be efficient and make the best use of every time you spend with the guitar; deliberate practice is what makes elite musicians become who they are. Also, as much as practice is important, you must also ensure to lay your hands on the right materials, this speed up the rate at which you learn. Playing the guitar come with levels. 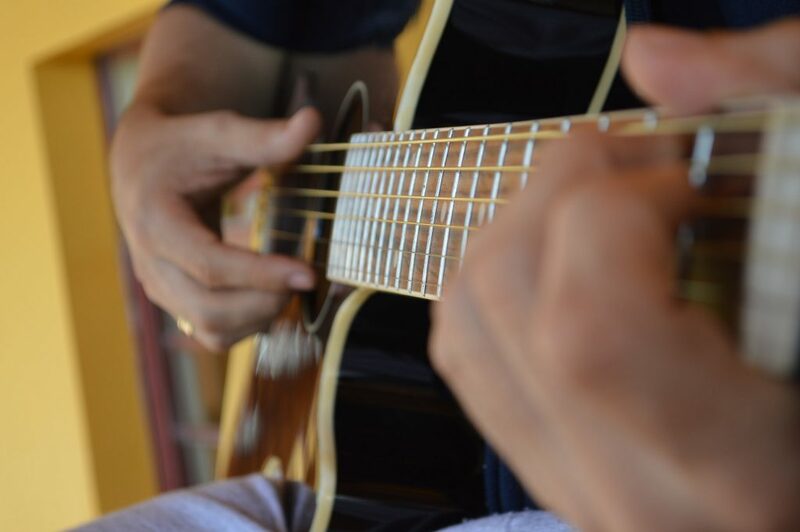 The topmost level of Proficiency in guitar comes with nothing less than 10,000 hours of practice which is equivalent to 20 hours of practice a week for 10 years. That’s a huge sacrifice but that will mean you’ll be entertaining the crowd with that level of skill. If your desire is just to learn how to play your favorite songs, strum the chords, sing along in order to impress friends or that beautiful lady, then you’ll surely need less time for that, hopefully just one month. The level of your Proficiency on the guitar depends on the ultimate desire. With guitar, there is nothing such as talent. Your talent in playing guitar will be determined by the number of consistent and productive hours you put into practice. The growth of anything depends on the foundation. Jumping steps might be too costly, learn from the scratch and follow the due process. Your focus should be on having direct access to the best materials on how to learn guitar, and tips on how to play guitar excellently well. It takes longer when you don’t have access to materials, being self-thought is good and it makes you discover new things, but it is better to have a solid foundation by learning from veterans either through materials or direct contact. If your interest in the guitar is huge, take your time to study every component of the guitar and their role or function, what every component is and what they do. From the bridge to headstock take some time to get to know the guitar. Some guitar players might not know everything the guitar is made of, but professionals do. Between 1-2 months; You should be able to play some chords, songs that don’t have too much of tone variation. Playing some of your favorites songs on chord should come easy. Not much string jumping is expected at this stage. Between 3-6 months; Graduate to playing more tricky and difficult songs, which necessitate more technicality. For instance, songs that require hammer-ons, pull-offs and other easier techniques of lead guitar. In 1 year; Choose to play songs that are intermediate level songs, guitar instrumental songs and lots more. This will give you more affinity with bare chords. In 2 years; If you’ve been consistent with practice, you should be playing almost every song at this stage. Even if you’ve not practiced a song before, it is expected that you would have mastered all the techniques. In 2-3 years; Theoretical knowledge at this stage will allow you to improvise and do special stuffs. In 5-6 years; Expected to be an experienced guitarist and you should choose and play anything without challenge. In 10 years; The more you know, the more you know that you don’t know. At this stage, you’ll want to keep adding to the collection of your techniques with various guitars. About 7-12 guitars a year. In 20+ years; A veteran, there’ll hardly be any time that people won’t want to listen to you play. At this level, you’ll choose to be playing 3 favorite guitars among many. Make it your most productive way of relaxing. Ensure to be amidst musicians who have strong motivation and desire to sing, jam, write and take the world of music by storm. Compose songs and play it repeatedly.